It’s been a while since I last wrote about Ceramic Dental Implants, and I have learned recently that a lot of progress has been made! Ceramic dental implants are an alternative to normal titanium dental implants. Why ceramic dental implants? What's wrong with titanium implants?Titanium dental implants have a track record going back to 1965. Check out how dental implants were invented by Professor Branemark at Dental Implant History. The modern versions are very, very strong, bio-compatible, and extremely reliable. The success rate is over 90% - almost unheard of general surgery! First, latest studies are showing a significant rate of peri-implantitis with titanium implants. Peri-implantitis is when the tissue surrounding the implant becomes agitated and inflamed. How effectively the patient brushes and cleans around the implant is ONE cause, but titanium seems to attract more bacteria and plaque than ceramic. Second, there is some evidence that microscopic titanium particles may come off the implant and get trapped in the jaw bone. Recent studies show that titanium particles are also found throughout the surrounding soft tissue, bone, lymph nodes and even distant organs. Nobody knows if this might cause a health problem or not. Third, they are grey in color. Not a problem if the implant remains under the gum, but sometimes you can see the greyness through the gum. I have also seen the gum around an implant shrink back over a couple of years, exposing the metal surface itself. Not a good look! Fourth, today’s titanium implants have seen a steady increase in alloy elements added to titanium in order to improve their physical properties and decrease their price. These new alloy elements are not always as well tolerated by the body, causing some people to have an allergic reaction or intolerance. Fifth, a lot of folks nowadays would prefer to get a "metal-free" implant if possible. They just prefer to minimize the amount of metal in their bodies. So, can ceramic dental implants be a viable alternative to traditional titanium dental implants? Here's my review of the current "State of the Art"! Ceramic dental implants are made of zirconium oxide, also called Zirconia. 1. Bacteria and especially plaque does not stick to zirconia like it does to titanium. Studies confirm that the bacteria adhesion is greatly reduced which should lead to less soft tissue inflammation. 2. Zirconia does not corrode, unlike titanium; Zirconia does not release any tiny fragments into the surrounding soft tissue, bone or lymph nodes. 3. They are tooth-colored, so they don't create a grey shadow under the gum. 4. And they are metal-free. Zirconia implants have another feature that is an advantage in certain situations; they can be made in one piece and do not have a separate connector for the crown, where microscopic bacteria can collect. (This can be a problem for titanium implants, and is the cause of red and inflamed gums around some implants). Zirconia implants have greatly advanced since my last publication. The major drawback to Zirconia was due to its system design - the implant had to be placed extremely accurately, at the correct angle, and it was very difficult to make adjustments to the angle of the subsequent crown, making ceramic implants more complicated for the surgeon. Now, new designs of ceramic dental implants are "2-piece", and work for the surgeon much like a titanium implant. After the implant has healed up and "integrated" with the jaw bone, the latest designs can correct for angles and different surgical positioning, eliminating my earlier concerns about complications for the surgeon. Even though ceramic dental implants do not have the "micro-gap" that titanium implants have, it is still possible for plaque bacteria to collect around them, causing peri-implantitis. 1. I used to worry about HOW WELL the ceramic surface would integrate with the jaw bone. The newest zirconia implants are reporting a 98.5% success rate. These systems have a roughened surface just like titanium does, and that allows for a much greater osseointegration - how well the bone "sticks" to the implant. But there was one issue that was unclear about ceramic implants. - I worried that Zirconia might "age" due to water absorption, and slowly lose strength over a period of years. BUT Loma Linda University recently published a study that shows that aging does not negatively affect the strength of Zirconia. Simulations show that ceramic dental implants can last many lifetimes without losing their strong structure. At this point, you may wonder why zirconia is not the "standard of care" for replacing missing teeth! THE ANSWER IS - a lack of knowledge, and a lack of experience – the research is new. In the medical profession we must be cautious. BUT the information does seem to support the potential for Zirconia to take over from titanium. It will take training and time , as surgeons learn more about this new material. One concern is that Zirconia is more expensive to produce than titanium. Implants are already a significant financial investment, but I believe that investing in your health is always a good investment! In the future, I believe that ceramic dental implants made from Zirconia are going to become more and more popular, due to patient health and aesthetic concerns. Where can I get ceramic dental implants? 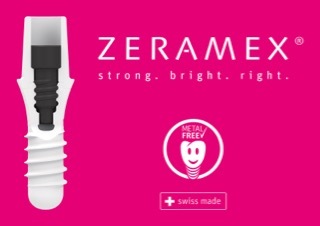 STRAUMANN is another Swiss company with a good reputation in the dental industry for it's conventional implants. Here is a link to their webpage. * CeraRoot (Oral Iceberg, Barcelona, Spain) - FDA approval since January 2011. * Zit-z (Ziterion of Uffenheim, in Germany - part of the Dentsply group). To my knowledge, these implants are not yet available in the USA. So, should you ask your dentist about ceramic implants? It depends on your personal priorities. What's important to you? If you want tried-and-tested reliability, and it's a back tooth that needs replacing, I would recommend a titanium implant. But if you want the best appearance for a front tooth, and don't like the idea of a metal implant, then I think that ceramic dental implants are now reliable enough to be a serious contender!